This Elements of Drama and Fiction Notes and Activity comes from our A Midsummer Nights Dream Literature Guide from Secondary Solutions, although it could be used for any play or book study. 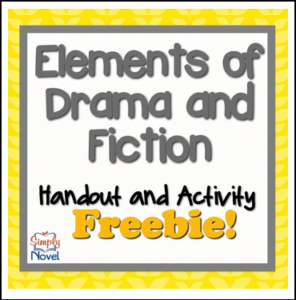 Includes two pages of notes on the elements of drama and fiction, including definitions/explanations for drama, comedy, character, protagonist, antagonist, setting, plot, conflict, theme, act, scene, dialogue, monologue, soliloquy, aside, dramatic irony, foil, double entendre, pun, iambic pentameter, and iamb. Also includes a one-page activity analyzing the plot structure of Little Red Riding Hood (story of Little Red Riding Hood not included). Answer key included. Please Note: Common Core State Standards have not been individually notated within this Guide. Activities and lessons for this Guide are aligned with the CCSS, however, Comprehension Check Questions, quizzes, and tests may not expansively address the full rigor of the Common Core. Also, don’t forget to “FOLLOW” us for exciting new product announcements, sales, promotions, and more! For teaching tips, advice, and more, please follow our BLOG!